"Intel takes another swing at AMD with Cascade Lake CPUs with 56 cores." If you have come across Alphacool in the past, it’s probably because you have some experience with custom water-cooling, rather than AIO coolers. For a while now, Alphacool has been introducing products under its Eisbaer range which are aimed at bridging the gap between maintenance-free AIOs, and custom loops. These pre-built, pre-filled units share a lot in common with custom water-cooling loops, primarily in that they can be disassembled or expanded. 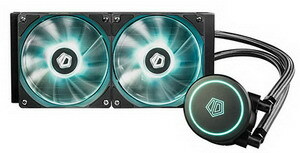 With the Alphacool Eisbaer Extreme priced at just under £230, is it worth the money? "SilentiumPC, introduces the new Sigma HP Corona RGB 120 Kit, a product that will instantly bring any PC system up to speed with the RGB revolution! The kit includes three 120 mm Sigma HP Corona RGB fans and the tiny, yet powerful Nano RGB controller. Built-in inside the ring-shaped casing are 18 bright RGB LEDs, that enable the users to choose from any colour to create stunning lightning effects. There are three methods of controlling these effects. First, manually, using the included Nano RGB controller which has several pre-defined modes, from constant lightning, through slow, gradual color change and breathing to aggressive strobe. Additional button speeds or slows down each of the effects and can also turn the illumination off completely. Next option is using the proprietary SilentiumPC Aurora Sync and Sync PRO controllers pre-installed in selected Armis cases. Last option is simply connecting the fans to the RGB-capable motherboard and using the software such as ASRock™ RGB LED, Asus™ Aura, EVGA™ RGB or MSI™ Mystic Light. Despite being heavily focused on aesthetics, the airflow characteristics are not compromised. Fixed speed of 1.500 RPM is carefully set for optimal noise and high-static pressure rating, while HBS bearing ensures smoothness and reliability. The rotors are easily removed for cleaning and maintenance. The new Sigma HP Corona RGB 120 Kit is available soon at 25,90€ (incl. VAT/Taxes). 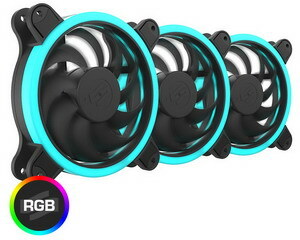 Individual fans are also available as a separate product at 10,90 EUR MSRP." "Scythe presents two special editions of its CPU Cooler models Kotetsu Mark II and Choten as part of the ASUS™ TUF Gaming Alliance series. Both products bundle their unique advantages with the fancy design of the TUF Gaming Alliance series and gorgeous RGB illumination. Scythe Kotetsu Mark II TUF Gaming Alliance Edition is based on the award-winning Kotetsu Mark II, offering outstanding performance even for overclocking purposes at impressively low noise levels. The Scythe Choten TUF Gaming Alliance on the other hand, aims for much more compact PC case environments while providing excellent balance between size, compatibility and performance. Both Kotetsu Mark II and the Choten are the first Scythe CPU Coolers to join the ASUS™ TUF Gaming Alliance. The beautifully designed cover plates adopt the unique patterns of the TUF Gaming series from ASUS™ while the new Kaze Flex 120 RGB fan assures outstanding performance and offers modern RGB illumination. Scythe integrates eight RGB LEDs, which are located in the ring around the fan motor, in order to create consistent and bright illumination of the translucent fan blades. Users are able to take full control of the RGB illumination by connecting the fan directly to an RGB-enabled motherboard. This way it is possible to synchronize the colors and effects using the Asus™ Aura or other compatible RGB systems. Support for a big variety of sockets has been an advantage of Scythe CPU Coolers and an important feature ever since. Both of the new TUF Alliance CPU Coolers are utilizing Scythe’s Hyper Precision Mounting System III (H.P.M.S. III), that is based on a back-plate mounting system with spring-loaded screws for balanced contact pressure. Convenient and hassle-free installation is assured thanks to the updated rubber and plastic spacers, that are holding the backplate secured to the motherboard. The compatibility list includes the Intel™ sockets LGA775, LGA115x, LGA1366, LGA 2011 and LGA 2066 as well as AMD sockets AM2(+), AM3(+), FM1, FM2(+) and AM4. Scythe Kotetsu Mark II TUF Alliance (Model-No. SCKTT-2000TUF) and the Scythe Choten TUF Alliance (Model-No. SCCT-1000TUF) are available for 36,00euro." "Noctua today presented its new NH-U12A premium-quality quiet CPU cooler. The NH-U12A is the latest, 5th generation of Noctua’s award-winning U12 series of 120mm size coolers. Conceived to push the envelope of the 120mm form factor, it combines two of Noctua’s flagship model NF-A12x25 PWM 120mm fans with a completely redesigned heatsink featuring 7 heatpipes and an increased fin surface area for superior heat dissipation. This way, the NH-U12A can rival the performance of many 140mm sized coolers while offering 120mm class case and PCIe compatibility. Topped off with the trusted, pro-grade SecuFirm2™ multi-socket mounting system, Noctua’s proven NT-H1 thermal compound and a full 6-year manufacturer’s warranty, the NH-U12A is a deluxe choice that combines top-tier performance with excellent compatibility and outstanding quietness of operation." 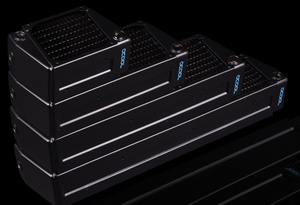 The Reeven Okeanos RC-1402 features a dual fin stack heatsink with the capability of taking three 140mm cooling fans, resulting in very capable cooling performance. There’s a lot to unpack from the name of the Thermaltake Water 3.0 360 ARGB Sync. The ‘360’ obviously refers to its 360mm radiator, and we know ARGB = Addressable RGB lighting. The ‘Sync’ aspect references software compatibility for the Water 3.0 360 with current motherboards, and it’s great to see that the cooler supports ASUS Aura Sync, GIGABYTE RGB Fusion, MSI Mystic Light Sync, and AsRock Polychrome software. Priced at £158.99, this is not the cheapest liquid cooler we’ve ever seen – there are a few 360mm AIO coolers on the market for a little less, with some closer to the £110 mark. That being said, it will be interesting to see how the additional £50 is justified, whether it is with features or sheer performance. "Alphacool is an internationally renowned company in the field of watercooling solutions for both industrial and end customer. Constantly innovating and improving both server and home solutions, Alphacool strives to create the perfect solution. Perfect for workstations and servers The 40 mm NexXxoS radiators are specially designed for server racks and workstations. 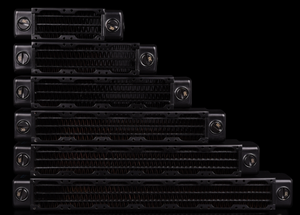 Due to their low height of only 40mm and the special M3 mounting holes on the top and bottom, they’re perfect for 1U server racks. Alternatively, the radiators can also be mounted in the classic way using the mounting locations of the fans. M3 screws are also required here. Alphacool always uses copper in its NexXxoS radiators. Alphacool is the only manufacturer that uses pure copper for all water-bearing components. Starting with the end chambers, the water channels and the cooling fins, everything is made of pure copper. Only the connecting threads are made of brass, as pure copper would be too soft for the threads and would give way over time. 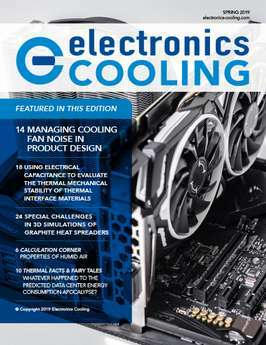 There are several approaches that Alphacool uses to increase the cooling capacity. Using copper ensures the best properties to dissipate the heat. Aluminium, which is often used in low-cost products, is not as good as copper in terms of heat capacity and thermal conductivity. Compared to some other manufacturers, the copper fins are only thinly painted. This means that the cooling performance isn’t affected at all unlike a thick coating of paint which would act as a insulator. The fin spacing is 10 FPI for optimal performance. This means that the fins are close enough together to create a large surface, but also far enough apart not to obstruct the air flow. In addition, all fins are designed to provide controlled air turbulence. This means that the air flowing through the fins is more efficient and is directed exactly where it is needed. The water flow in classic PC radiators is U-shaped. This means that the water inlet and outlet are on the same side on the radiator. This has certain advantages in the normal PC, however, it is difficult to set up a reasonable cooling loop like this in an extremely flat server. Due to the X-Flow technology, the input and output are located on the opposite sides. This makes it very easy to create a loop in the server rack. For example, you could go out from one side, directly into a CPU, then into one or more graphics cards and the pump, then back to the radiator on the other side. 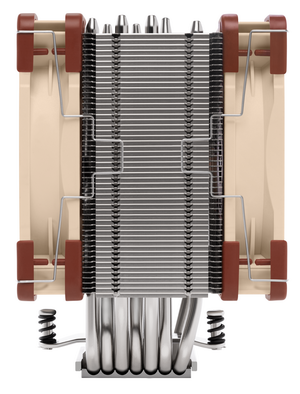 Each NexXxoS 40 mm X-Flow radiator has 3 ports on each end of the radiator. This means that almost any conceivable mounting position can be achieved. The connections are located on each side in the opposite position and then one at the head ends of the radiators. 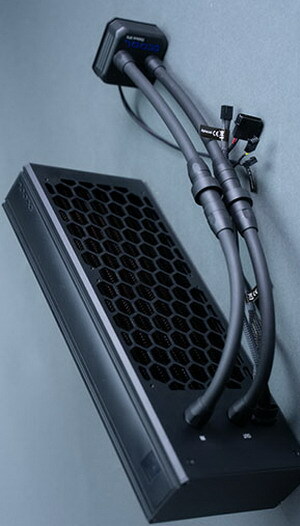 Alphacool has developed special patented stop plugs that are flush with the radiator to avoid them fouling the case. Previous solutions always exceeded the length or width of the radiator because they were not countersunk." "A brief listing of items too large to fit in the top of a Phanteks full tower chassis. Small cars. Small children. Large cats. Baby Elephants. Adult Elephants. Alphacool’s Eisbaer Extreme. All joking aside this thing is huge! Alphacool doesn’t mess around when it comes to system cooling and the Eisbaer Extreme “AiO” cooler is no exception. Designed around a standard NexXxoS 280mm radiator, this cooler is custom watercooling streamlined into an elegant prefilled loop, ready to go, out of the box. Follow along as we find out just how well this loop keeps our CPU cool and whether it’s the right fit for you!" The Noctua NT-H2 and NA-SCW1 are effective solutions in keeping the CPU cool and clean, respectively. While the ARCTIC Freezer 33 eSports Edition CPU Cooler may look quite aesthetic, it unfortunately falls short of our recommendation. Find out why here"
We reviewed the Scythe Ninja 4 a couple of years ago and recommended it. Not hard really, Skythe are an old-school PC cooling and accessory company who have been around since the start of the modern enthusiast’s system building era. 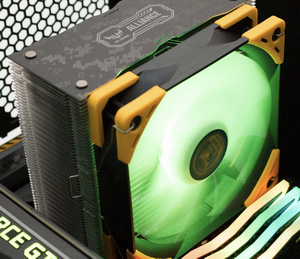 Scythe sent the Scythe Ninja 5 CPU Cooler to review and we are more than happy to oblige. Digitimes reports a substantial shift in business from one of the largest heatsink manufactures... "Asia Vital Components (AVC), which specializes in thermal solution products, expects demand for smartphones to boom when 5G devices become commercially available. AVC has shifted its thermal product focus to handset use, said the company, adding that demand for 5G smartphones is set to surge. AVC has long focused on PC- and notebook-use thermal solutions. Meanwhile, AVC will be improving the cost structure of its system assembly and chassis making business through optimizing automation equipment, the company continued. AVC expects its overall profit increase to outperform revenue growth this year. AVC reported consolidated revenues grew 7.2% to NT$29.07 billion (US$941.1 million) in 2018. Of the total revenues, sales of its thermal parts accounted for 58% followed by its system assembly business with 20% and chassis revenues with 16%. 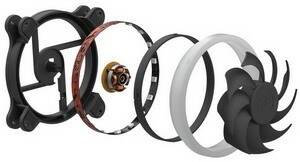 AVC also provides peripheral products such as camera modules and bearings, which account for the remaining 6%." Download a digital copy while you can, the article on Thermal Mechanical Stability of Thermal Interface Materials is interesting research. "Competition drives change, and the Mugen 5 (Rev. B) shows how improvements over time result in a great cooler. Each generation of the Mugen builds on the foundation of the previous generation. This version of the Mugen brings much to the table including coverage for the latest AMD and Intel sockets, a fast, easy installation (with the included screwdriver) and plenty of room for RAM with tall heat spreaders. The 120mm Kaze Flex fan is about as quiet as it gets and it moves plenty of air through the fins stack, effectively removing heat from the CPU."